I am a petrographer at the University of Padova, Italy, studying the metamorphic rocks that form the deep Earth’s crust beneath our feet, and what happens when they get so hot to start to melt. I’ve spent (enjoyed I should say) more than 30 years looking at rocks with an optical microscope. This simple, cheap tool, and more importantly, its skilled use, remain key ingredients for good research in petrology! I’ve been taught by scientists, like Ron Vernon of Macquarie University in Australia, that a good micrograph is essential to document my research and strengthen my conclusions, and so I’ve always paid particular attention to the quality of photos. In the meanwhile, I have also developed a particular interest in photomicroscopy with an aesthetic purpose, realizing that the cocktail of rocks and polarized light has an extraordinary potential in the ‘sciart’ (Science-and-Art) field. The digital revolution has marked a turning point in this activity, and 10 years ago I have started my micROCKScopica project to showcase to the public the beauty hidden in the small slices of rock that are thin sections. When I find a photogenic rock I play with polarizers to get the desired combinations of color, and then I take a photograph. And people can enjoy the images, their colors and shapes, even without knowing the geological history behind them. 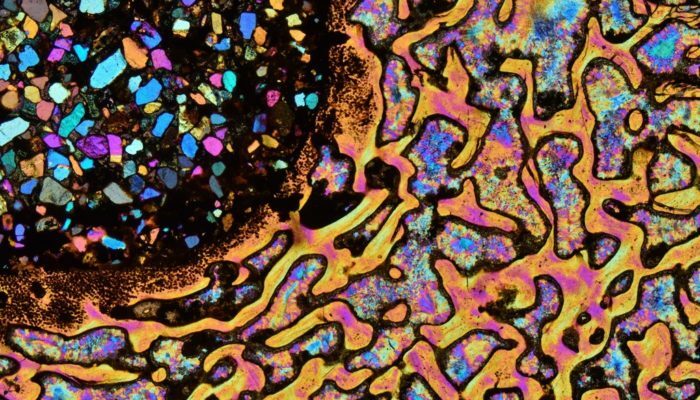 This is particularly true for this photograph: it is a thin section of a piece of dinosaur bone but I don’t know much about it (what bone, which dinosaur), only that it had been collected in Utah, in the United States. I received a small sample of the bone by Denise M. Harrison, a friend with whom I collaborated for a book on Lake Superior Agates. She is an award-winning lapidary (someone who cuts, polishes and engraves stones), and makes lovely cabochons with all sort of semiprecious, hard stones. I asked her for some leftovers to make some thin sections, because I wanted to see something new, possibly silicified (impregnated with silica during fossilization) because chalcedony – the very fine-grained variety of common quartz – may be extremely photogenic. I had no idea of how a bone could look like under the microscope, and the first sight left me speechless! The porous structure, and the patterns of the radiating textures in the chalcedony fillings are extraordinary, and provide a wealth of possibilities for nice images. In this shot, that I replicated in red and blue, a larger hole had been filled with a fine-grained quartz sand – the dark moon shape on top left – somehow interrupting the regular pattern of the bone tissue, that to someone may recall Australian Aboriginal artwork. Editor’s note: The fossil sample featured in this photo was collected and distributed legally from Utah.